The Canuck Place classroom is a place where imaginations run wild and children learn in a supportive environment. For Canuck Place’s very own schoolteacher, Kay Lever, the classroom is a space for education and also healing. Bear in a Chair began as a program for children who were undergoing treatment for cancer. Kay has recently implemented it at Canuck Place. 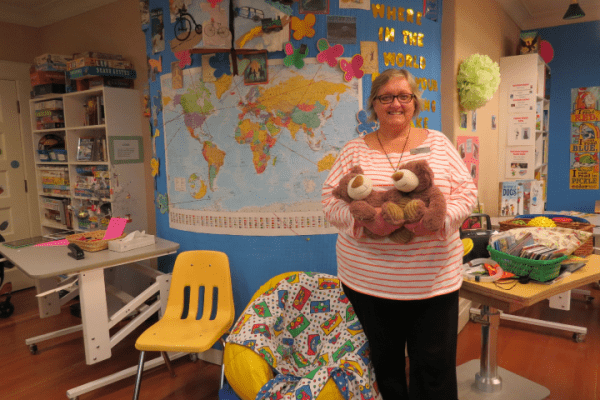 A stuffed bear occupies the child’s seat in the classroom until their return from treatment and serves as a tangible way to allow both child and classmates to stay connected to each other. In the meantime, the bear accompanies classmates on school trips and children are encouraged to speak to the bear, ask questions, and write comments or short stories to share with their friend who can’t attend class. But what happens if the child never returns? Addressing life-threatening illness and grief is difficult, but in Kay’s classroom, children find a welcoming learning environment that allows them to participate in creative activities and express their emotions. Bear in a Chair is a unique example of that. Your donations help supportive programs like this. Give today.